Well, when you put it that way! Then again, I hope I’m not thinking about sofas at all on my deathbed… But I get his point. I think this staircase would give me a migraine if I had to go up and down it too many times a day. But I’m not a big “pattern” kind of girl. Or a shiny wallpaper kind of girl. He put a red and black paisley ping-pong table in his living room. My kids would love this! Adler says, “I think formal living rooms are a thing of the past.” I don’t think many New Yorkers would have this kind of luxury, but his duplex is a roomy 2,500 square feet. He has 2 new books out this month about creating happy spaces: Happy Chic Accessorizing and Happy Chic Colors. Are you an Adler fan? Do his designs make you happy? You can read the article and see the slideshow of Adler’s place at WSJ. Photos by Jessica Antola. I can appreciate Jonathan’s work, in fact I like it. But that doesn’t mean I can apply his style into my home. Maybe some of it, some punches of color here and there, with some pillows.. things that can be changed easily. My favorite photo is the bedroom one… it looks so fun! Whew! That’s all too much for me. Love this!! So nice and colorful!! .-= Ami @ beyondpeasandcarrots´s last blog ..Curried Quinoa =-. LOVE Jonathan Adler! Thanks for sharing this! .-= Stacie Staub´s last blog ..2892 Cherry – Park Hill 400-000 =-. Just looking at the staircase pic almost gave me a migraine, don’t even have to run up there:), having said that, love his attitude to color!! I may not be able to replicate it but do love bursts of color. Also, great deathbed quote! Love your blog, its my escape-to-a-happy-place when all around me is going crazy! .-= Courtney @ nesting instincts´s last blog ..swan song =-. I love his happy style! Not sure I could live with it in my own home, but I love seeing it. My favorite of these images is the bedroom (and probably comes the closest to the one I could live with the most easily). .-= pk @ Room Remix´s last blog ..A Pretty Bedroom Makeover =-. .-= Laura´s last blog ..A beach day- for a November birthday girl =-. Not for me, but that doesn’t make either of us a bad person. LOL! OK, you know I have to make more of a comment then that! I was just thinking that if an ordinary, not famous happy homemaker type person decorated their home in this style, they would be thought of as…how can I put it nicely?..eccentric, and would be fodder for some design do over on TV. But, when a designer does it…they are genius! Just saying… LOL! .-= Pat´s last blog ..Breaking the Silence =-. .-= Becky @ Farmgirl Paints´s last blog ..My winter porch =-. Looks like a great place to work, like an office, but I wouldn’t want to live there. I want home to be much more visually quiet. I am going to be reviewing both of Adler’s new books this week. I will also have a chance to meet him Thursday night. I will take pictures! Thanks for the information on him :). I feel so much more prepared now…. Happy? No. Schizophrenic? Maybe. There’s a fine line between eclectic and jarring and these spaces are too much for me. Looks like he’s trying too hard. I like some of the elements, but all together these rooms look like a yard sale. Well, he certainly does love mixing his colors and patterns. One does get tired of all the “safe” beige on beige. It’s unusual to see a man using color and patterns…so many just go with the black, gray and silver look that tends to be cold. He’s a little over the top for me but I love the colors he uses… I just would tone it down a bit. .-= Teacup Lane´s last blog ..When Im Sixty-Four =-. Yes, and yes! I love his style and sense of color matching. So refreshing and FUN! Meh, it’s okay. I think he try’s to hard to be different, kind of like KW. .-= Janet´s last blog ..So Wanna Rock This! =-. Hi Julia – J’adore JA! I loved it when he was a judge at HGTV’s design star. His living room and dining room are both cheerful and comfy…I think I like it. That staircase however….100 % will give me a migraine as well. .-= Marie´s last blog ..Back from Charleston- Yall! =-. Those Fun House stairs look like they could be a hazard to navigate first thing in the morning… or last thing at night… or after a drink… or, well, almost any time, really! .-= Lori-Anne´s last blog ..A Passion for the Past =-. Beautiful place, but I agree, the wallpaper in the staircase needs to go. .-= Cole´s last blog ..14-900-000 – Miami Beach- FL =-. I love that he isn’t afraid. We all get stuck in what we “think” our homes should look like by society’s standards. It’s gets to be so blase’ and boring. I also love that he builds all of these funky colors and patterns over easy to look at and interesting furniture. Brings a little new to the old! BRAVO! That staircase is truly eye popping! I do admire his style, but I couldn’t go full bore the way he does. .-= Nichole´s last blog ..Giveaway Winner! =-. What I find interesting is that, where Adler’s choices in pieces is most definitely edgy, how he uses them is quite traditional. Other than the colors he uses, and placement (ie: ping-pong table in a living room), I find the over-all feel of his space to be quite traditional/conventional. .-= Catherine´s last blog ..Diving Bells or Butterfies =-. 70’s functionality with a fairly deep sense of traditionalism. Some people just do things for shock. .-= Kimberlee J.´s last blog ..SRNI was =-. Not my style. I have never been a fan of modern or contemporary. That’s why I could never live here. There is a little too much going on there for my tastes, but I appreciate how it looks. It would be a cool place to spend some time in, for sure. .-= Jocelyn Stott´s last blog ..The Reason I Havent Posted Lately =-. Oh I love Jonathan so much!!! Such a wonderful space! I want to be this bold and confident with color. His spaces always look so happy. I need to paste these images on my fridge as a reminder not to chicken out and get yet another neutral. .-= hip hip gin gin´s last blog ..Kate Spade Giveaway Winner! =-. Way too much going on for me. I don’t like all of those patterns everywhere. Too confusing and distracting. And not calming at all. I was noticing that in every picture (minus the bedroom and crazy stair well) the walls are stark white, and the furnishing and details are crazy bright. I definitely prefer interesting architecture in a house over exciting furniture and details any day. To me that is similar to having beige furniture inside of painted/wallpapered walls. Things would get really crazy in these Adler designs if the walls were as busy as everything else. I would choose a beautifully designed space over furnishings for myself, but not everyone loves the same designs… if they did, there would be a lot of designers out of work! .-= Ashley´s last blog ..Inspiration =-. I like his style. If you notice, most of his rooms are white or neutral with (ok-many) pops of color. As an artist, I like neutral walls, and I like to move my art around from room to room. I also like to change out accessories. I would probably go for neutral sofas with crazily colored chairs because they are easier to reupholster and slipcover. .-= Ricki Jill Treleaven´s last blog ..Carol Marines Daily Paintings =-. I totally agree with Pat #9 and I think it’s where our culture is right now. You get more recognition the more freakish and oddball you are and it has spilled over into decor too. Put any weird thing with other weird things and you are BRILLIANT. Wowza! That is a whole lot of look happening there! But he’s campy, fun and deliciously irreverent so Mazel Jonathan Adler. I wouldn’t expect anything less. I love his design philosophy and his quotable quips. I’ve seen some of his hotel spaces, it’s always fun to see designers’ homes. For my own space, I’d like to interject some of his use of color and fun elements. Some, not all. It’s nice when a home has some personality, I’m a big fan of surprises. AKA a rhino in the living room. P.S. I’m with you on the migraine inducing staircase. .-= Bre´s last blog ..Gather Around the Table =-. Those colors are sort of like candy–love it at first, but too much makes my head hurt. On the other hand, I love this line: “Then again, I hope I’m not thinking about sofas at all on my deathbed.” True that! .-= jennifer´s last blog ..Justice or Mercy =-. Fun to see. Not a fan though. .-= stuccohouse´s last blog ..Curses =-. Wow – If only I had a second home! How fun – but I could not look at that every single day of the year. .-= Trish @TheOldPostRoad´s last blog ..Fabric Ornaments and Printable Memory Cards =-. Cute place but that carpet makes me think of benzene. I think the attitude makes me happy, but that stairway would drive me crazy. .-= beth´s last blog ..Floors- 1- Can this floor be saved =-. What a great place…love all of the color, it truly is a happy place! .-= Stephanie@Geezees´s last blog ..You Capture – What inspires me Watch the sweet video =-. too busy for this girl. I want my surroundings to be calm and relaxing. love, Love, LOVE his philosophy and his happy colors! I’m SICK TO DEATH of going on so many blogs and seeing white, white, white and Paris this and that….thank you for the cheery post! .-= Tammy´s last blog ..Pump it up! =-. .-= Juju at Tales of Whimsy.com´s last blog ..Its raining contests! =-. I really really like it. There is so much energy in all of that color. It would make it more difficult to veg at home, but with me that would probably be a good thing. Get me to get up and do a good work-out or a project I had been putting off. Very cool, except for that wacky stairway. Love the quote about the persimmon sofa. So funny! 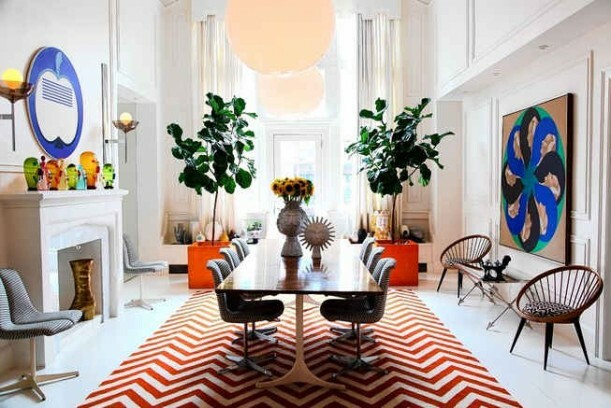 I do love Jonathan Adler designs (although that staircase is too much). I don’t live with that much color and pattern. But I think I’d like it. My husband, though…well, I don’t think so! .-= Lesley @ TheDesignFile´s last blog ..See custom holiday decor at Indy home event =-.